At the same time, there is urgency of progress regarding the implementation of the Sustainable Development Goals to achieve a better and more sustainable future built on the values of solidarity and human rights, social justice, equality, democracy and participation, entrepreneurship and environmental responsibility. The 2019 edition will not only be a very timely occasion for civil society organisations to address these key issues for the future of Europe but will also comprise, for the first time, parallel events on national level to engage as much as possible with citizens on crucial topics for all of us. Registration: Registration for the event will open up in mid-May. Once it does, you can access it here. Agenda: You can view the agenda, speaker line-up and full information of the event here. 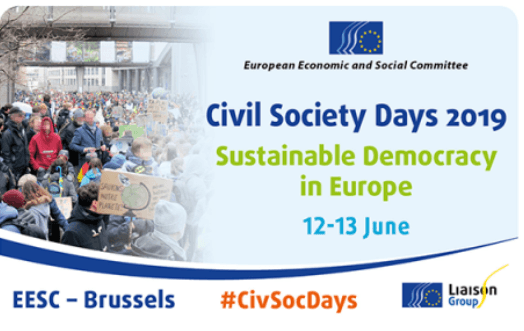 Civil Society Days 2019 are organised by the European Economic and Social Committee (EESC).